But now with services like Google's Place Autocomplete or Loqate becoming more common, which give users address suggestions for their input, wouldn't it make sense to change the order? 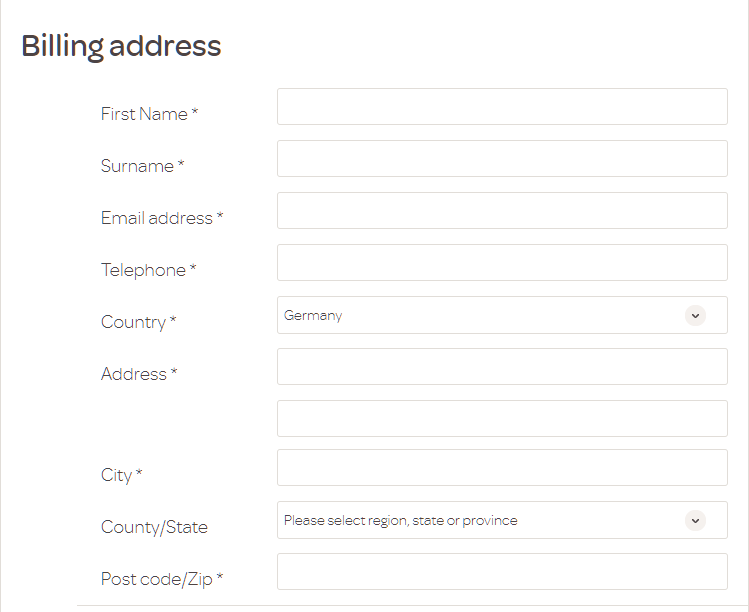 For example see here, the form starts with the address first and I start typing what would be "Main Street" in German. That of course procs a ton of different suggestions, since a lot of cities have a generic street name like that. So would it not be a much better UX to first make them fill out the city/postal code with the help of these APIs and then the street, which at that point can be made a hundred times more precise due to the code before? Completing the city/postal code first would allow your UI to propose a narrower selection but, in your context, this would go against the user's mental model of how an address works. To ask people to enter the address in an order other than this breaks with their expectation and may lead to higher error rates and user frustration. This is a hypothesis; if someone has studies we can refer to it would help. Note that there are places, such as Japan and China the order is reversed. This pattern is also reflected how dates are written in East Asia (YYYY-MM-DD) vs. Europe (DD.MM.YYYY). Yes, you can change the order of address fields on forms to improve completion. Many services on Brazil have done it and people adapted just fine. The following picture illustrates the address form in the registration of a big online store used on brazil that starts from the postal code. The site requires the postal code (CEP) to start. Many sites provide a link to the postal office search page, but many doesn't. @John Zabroski asked about the quirks listed on the last page of Luke Wroblewski's Research. Those quirks has to do with time to update the combos. Those quirks seem consequence of bad programming: The ajax request to populate the combo should be at onfocus event and should be sync. That way the "tab" or "click" would wait the combos to be populated before allow the user interaction with the field. The americanas.com.br example does something similar. It is a two step process: In the first you fill the postal code and confirm. In the second you see the rest of the form. I found easier that way. It is also important to notice that Wroblewski's research used a small sample of 32 subjects that was aware of the testing. The results are very interesting, but should be taken with a grain of salt. I suspect the percentage of persons affected by the quirks would be way smaller on a blind study with a bigger sample. This is not excuse for the bad programming tough. Filling out an entire address form in reverse order will likely be confusing for the user. So I suggest to break it down: first, the user only sees the input field for the zipcode and city. This could be done earlier in the registration process, or just in a different page / step. At this point, there is no expectations that they have to give their entire address. Once the user gets to the page / step where they need to give their full address, the input fields appear in the usual order, but the zipcode and city are already completed. Not the answer you're looking for? Browse other questions tagged forms input-fields autocomplete addresses or ask your own question.